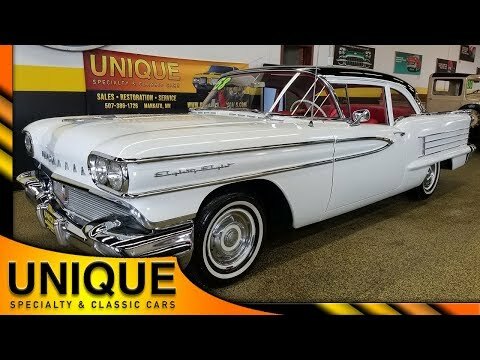 1958 Oldsmobile Eighty-Eight 2dr Coupe with a white paint job and a black top. Has had a repaint somewhere along it's life. Chrome and brightwork are in decent shape. Riding on stock wheel covers with white walls. Under the hood is a 371 Rocket V8 paired with an automatic transmission. Interior is a red and black theme. The door cards, headliner, seats, and carpeting are all in nice shape. Seats are vinyl red and black bench seats equipped with seat belts. Great starting and running Oldsmobile!